LaSiren | Take Back Halloween! LaSiren, also spelled La Sirène, is the Haitian mermaid goddess of the sea. Her mythological pedigree is impressive: enslaved Africans brought with them the memory of a great female water spirit, combined it with existing Taino legends about a sea creature, and added European mermaid imagery. The result was La Sirène, the reigning queen of the ocean realm. She wears a golden crown, carries a golden trumpet (to play her siren song), and lives in a fabulous underwater palace that’s crammed with sunken treasure. LaSiren herself is a magical vision of beauty, which is exactly what you’ll be in this outfit. 1. Sequined bodice. Start with a basic body shaper and paint it to match your skin tone; we used Simply Spray Chestnut Brown Fabric Spray Paint. 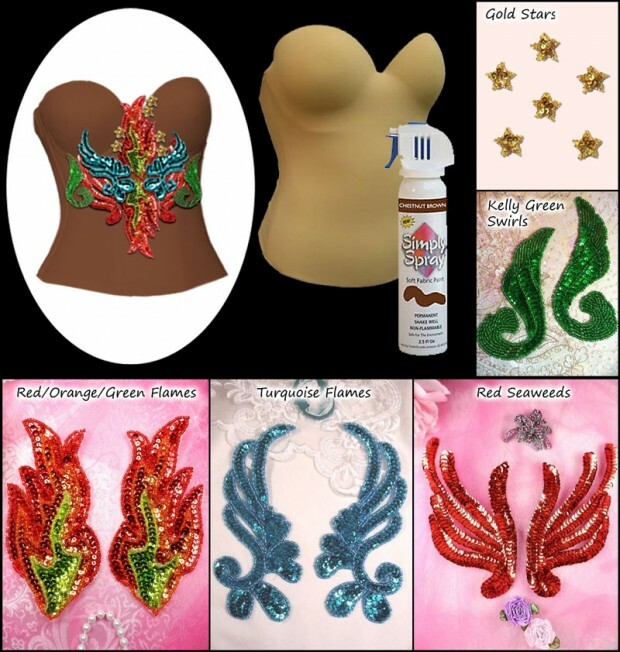 Then decorate it with some inexpensive sequin appliques, the kind that figure skaters and dancers use on their costumes. In the Tutorials section below we give you a complete list of the appliques you need along with a diagram of how to place them. 2. Mermaid shell bra. 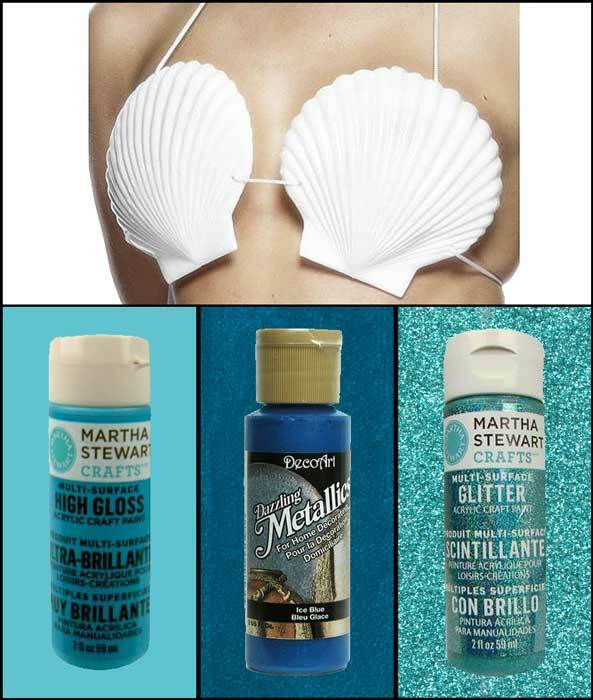 This is just a plastic shell bra that’s been transformed with craft paint. Use Martha Stewart High Gloss Pond for the base coat and let it dry. Then brush on some streaks of Deco Art Metallic Ice Blue, allowing some of the base coat show through. Top it all off with a couple of coats of Martha Stewart Turquoise Glitter. Glue the finished shells directly onto your bodice, as we show, or tie them on using the strings that come with the set. 3. Green sequin tube dress to wear as a skirt. Christian Soriano recommends sewing a tube skirt, but of course here at Take Back Halloween we do not sew. Instead we suggest you get a readymade tube dress like this and wear it as a high-waisted skirt. Another option is to make your own tube with a yard of stretchy fabric and a boatload of safety pins; see the Tutorials section below. 4. 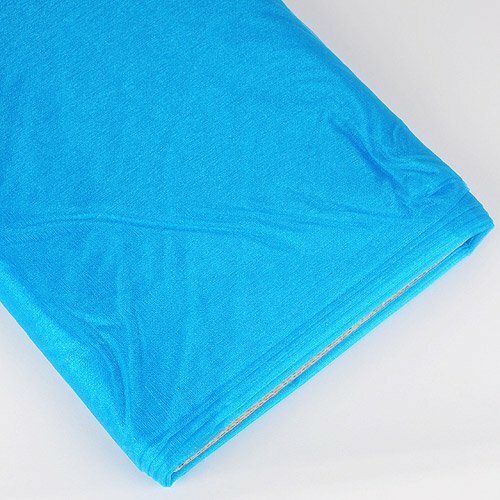 Turquoise organza fabric . This is what turns your green tube into a mermaid skirt. The video of Christian’s demonstration is in the Tutorials section below, along with some comments from us. 5. Golden trumpet. 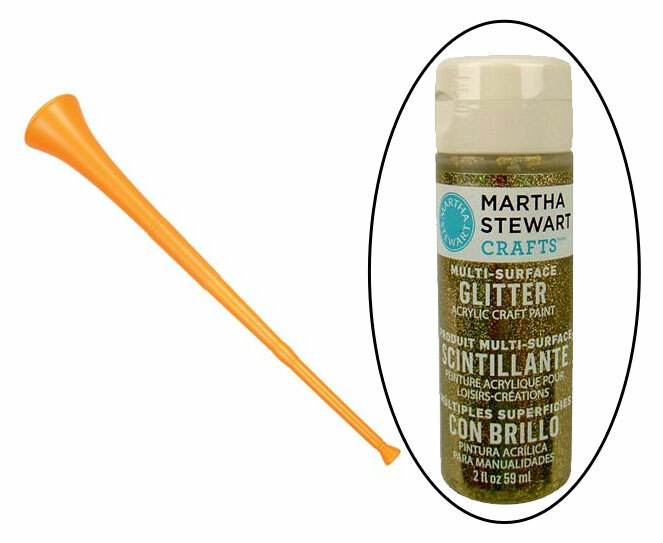 It’s a plastic vuvuzela covered in Florentine Gold Glitter Paint. You’ll need several coats of the paint to really get good coverage; a base coat of Metallic Gold Paint will help. Also, don’t blow this thing at a party or people will hate you. 6. 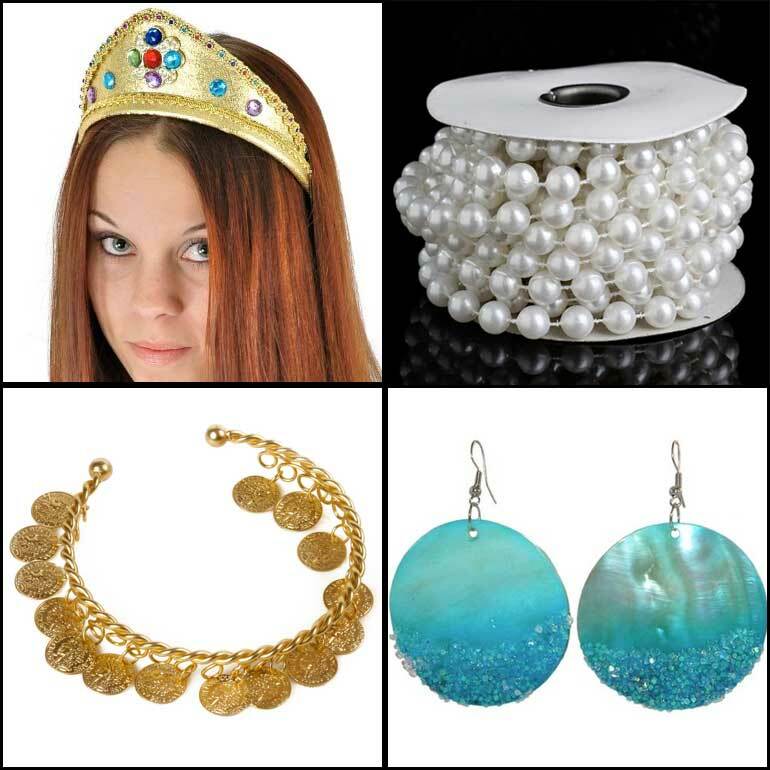 Gold crown , pearl beads, shell earrings , and coin bracelet(s) . Wrap the pearls around your neck a bunch of times and drape them around your bodice. You can also glue a few inches of pearls along the lower edge of the otherwise perfect crown. It’s not that this costume is hard; it’s just that we have three separate how-to thingies for it and we don’t want you to lose the plot. So we’ve grouped them down here in their own nice little section. Notice that the appliques are overlapped, which gives a nice dimensional effect. To attach them to the bodice just pin them lightly in the centers and use temporary tack glue to paste them down where necessary. Leave the bottom edge of the whole arrangement hanging free so that when you pull on your skirt the sequins will overlap the waistband. 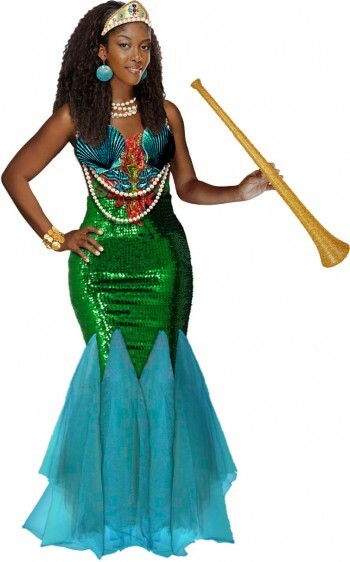 That will make it look all unified and mermaidish. Once you’re dressed you can use some discreet safety pins to keep the bottom edge of the appliques laying flat on your skirt. You can fold the top down inside to make a finished-looking waist. The safety pin seam will be a little bit bumpy, so center it in the back and attach one of the organza squares (next) over it at the bottom. Illustration credits: The painting in the upper left is “La Sirène” by Wilson Bigaud. The sequin flag in the upper right is “La Sirène with Plant” by Mireille Delice. 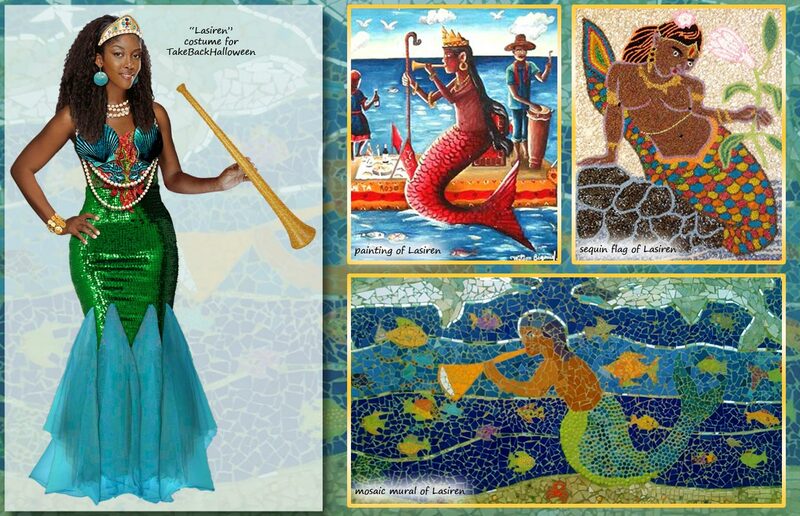 The mosaic mural is called “Sea Spirits,” and was created in Jacmel, Haiti, by Laurel True and the Art Creation Foundation For Children (ACFFC). And: Special thanks to the anonymous Kickstarter backer who commissioned this costume!